Eyeballs are a delicate miniature world of their own. They are crucial for sight, but there are many conditions that affect the eyeballs and the structures associated with them. It is with good reason that a veterinarian may recommend a referral to an ophthalmologist for pets. Here are some of the more common eye conditions that we see in cats and dogs at Coventry Animal Hospital. Blue eye: The lens of the eye is made of layers like an onion and senior pets often develop a bluish haze as the layers are compressed with age. This haziness is a normal aging phenomenon known as lenticular sclerosis and does not impact vision. 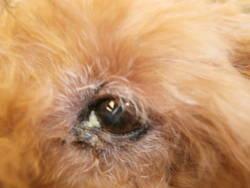 However, if your pet’s eyes seem hazy and have decreased sight, this could be cataracts. Over half of diabetic dogs will develop cataracts, but there are a number of other causes for cataract development including genetics or degeneration of lenticular sclerosis. Blue haze in your pet’s eyes should be evaluated by a veterinarian to determine whether treatment is needed. 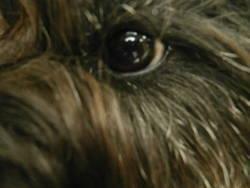 Dry eye: Keratoconjunctivitis Sicca is a condition where a pet doesn’t produce the watery component of tears properly. These pets have tears that are thick and goopy and are ineffective at lubricating the eye during blinking. Dry eye can be diagnosed with a Schirmer Tear Test that measures a pet’s tear moisture. This condition can occur after treatment with sulfa drugs, certain eye trauma or from immune-mediated disease. Animals with dry eye are prone to injuries to the cornea. Most eye conditions are quite painful. Signs of pain include squinting, rubbing the eye (with a paw or on furniture), redness, swelling and lots of eye discharge, especially if that discharge is coloured. Certain breeds are more prone to certain eye conditions and often multiple eye conditions will be found in the same patient. Some eye conditions can lead to abnormal pressures within the eyeball that can cost a pet its vision if left untreated. 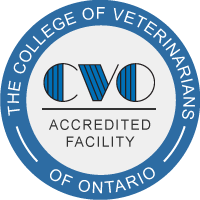 Coventry Animal Hospital recommends a physical exam by a veterinarian if your pet has blue, red, runny or dry eyes.